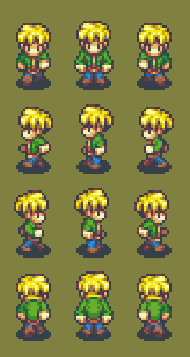 You might be interested in making your own sprites in the Time Fantasy style. You can go about creating sprites however works best for you. But I thought that some people might find it interesting and/or useful to see the process that I used to create the characters in the TF set. 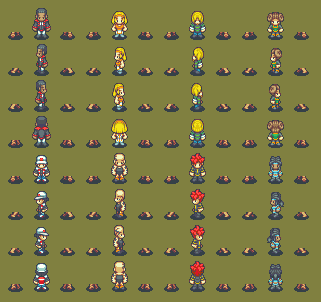 Since I make large packs with lots of characters, I’ll typically work with eight characters at a time (a regular RPGMaker sprite sheet has eight characters). I create all of their basic directions before I move on to animating them. 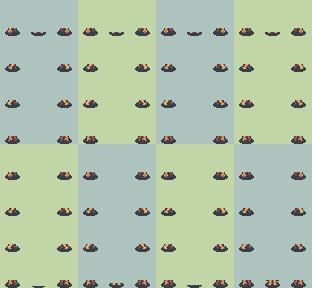 This method has proven to be pretty efficient when making large amounts of sprites like this. I’ll line up the four standing poses onto the “feet sheet”. 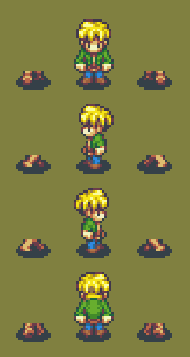 You can see that it has the stepping-frame feet from the animated base, but not the top halves of the sprites. Instead of using the entire base, I’ll use the feet/legs from the base, but redraw the torsos for the different frames. For me, this method is faster when creating a lot of sprites. Depending on the sprite, I might also copy the middle of the torso onto the other frames. Then draw arms to indicate the correct swinging motion. Then it’s easy to edit/color the legs to match the body. It’s a little distorted, so don’t try to use this one. If you want to use this character in your games, you can download the full character sheet here for free.